Generally, all metals can be classified into groups such as ferrous, non-ferrous and alloys. The ferrous group of metals is composed mainly of iron. They may have small amounts of other metals or other elements added such as carbon, manganese, nickel, chromium, silicon, titanium, tungsten etc., to give the required properties. Non-Ferrous are metals which do not contain any iron as a component. The common pure metals are: aluminum, copper, lead, zinc, tin, silver and gold. Alloys: An alloy is a new metal which is formed by mixing two or more metals and sometimes other elements together. The most used metals are: Iron, Aluminum, Copper, Titanium, Zinc, Magnesium etc. Iron is the basic component of steel. When carbon, a nonmetal is added to iron in amounts up to 2.1 %, the result is an alloy known as steel. In connection with the above mentioned steel is an alloy composed by iron and other elements such as carbon, manganese, phosphorus, sulfur, nickel, chromium, tungsten, niobium (columbium), titanium etc. Each element that is added to the basic constituent of iron has some effect on the properties of the steel. The alloying additions are responsible for many differences between the various types or grades of steels. Based on carbon content, the steels are divided into three main groups: low carbon steels /AISI1005 to AISI 1026, IF, HSLA, TRIP, TWIP steels etc/, middle carbon steels /AISI 1029 to AISI 1053/, and high carbon steels /AISI1055 to AISI1095/. On the other hand, according to EN standard, the steel grades are divided into the following steel groups: non alloy steels /EN DC01-DC06; S235; S275, etc./, alloy steels /2CrMo4; 25CrMo4 etc./, stainless steels, tool steels /DIN-EN 1.1545; AISI/SAE W110; DIN/EN 1.2436 AISI/SAE D6/, steels for sheet and strip, and steels for electrical sheet and strip /EN 1.0890; EN 1.0803 etc./. When considering non-ferrous materials, the most widely used metals are aluminum, copper, titanium, gold etc. High strength alloys are Ti-6Al-4V (grade 5), Ti-5Al-2.5Sn (grade 6), Ti-6Al-6V-2Sn, Ti-10V-2Fe-3Al, Ti-15V-3Cr-3Sn-3Al, Ti-5Al-2Sn-4Mo-2Zr-4Cr, Ti-4Al-4Mo-2Sn (Ti550), Ti-8Al-1Mo-1V. High temperature alloys like Ti-6Al-2Sn-4Zr-2Mo, Ti-6Al-2Sn-4Zr-6Mo, Ti-11Sn-5Zr-2.5Al-1Mo-0.2Si (IMI679), Ti-6Al-5Zr-0.5Mo-Si (IMI685), Ti-5.5Al-3.5Sn-Zr-1Nb (IMI829), Ti-5.8Al-4Sn-3.5Zr-0.7Nb (IMI 834), TIMETAL 1100 etc. The purity or fineness of gold in jewelry is indicated by its karat number. 24 karat (24K or 24 K) gold is the purest classification of jewelry gold. 24K gold is also called fine gold and it is greater than 99.7% pure gold. Proof gold is even finer, with over 99.95% purity, but it is only used for standardization purposes and is not available for jewelry. The most widely used Copper and its alloys are in forms of brasses and bronzes. A Brass is defined as a copper-zinc alloy with between 5 - 42 % zinc (CuZn28, CuZn37, CuZn42 etc.). The German name is Messing (Ms58 = CuZn42). Brasses are usually yellow in color. A bronze is an alloy of copper and other metals, most often tin (CuSn6, CuSn10, CuSn14 etc. ), phosphorus (PB1C, PB4C, PB3, LPB1C etc. ), Manganese(HTB1, HTB2, HTB3 ), but also aluminum (AB1C, AB2C) and lead (LG1C, LG2C,LG3C, etc.). 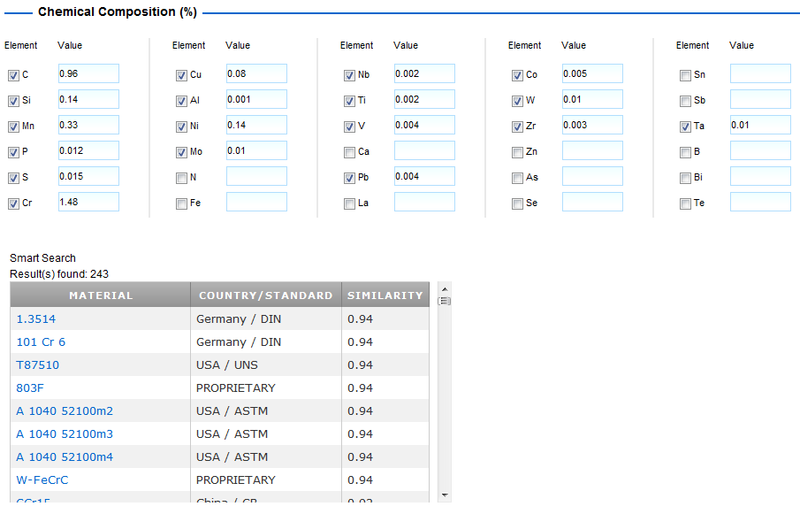 If you often need to identify unknown metals from their chemical analyses and/or to control conformity and quality, SmartComp is likely to be a very useful tool. 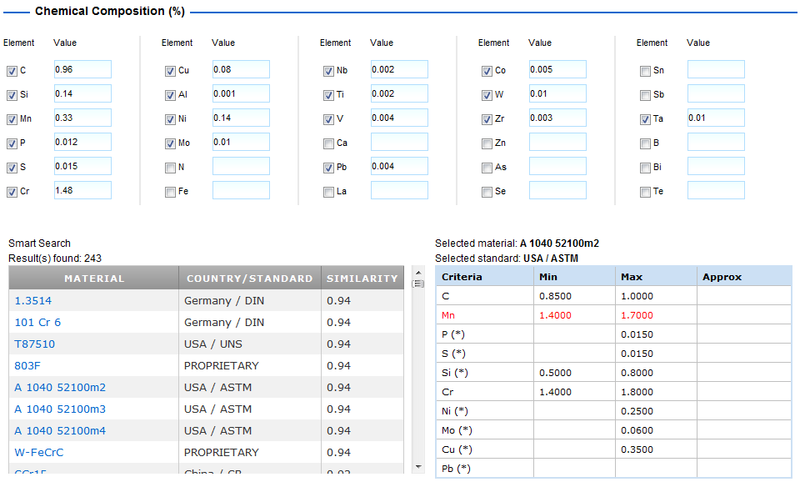 It is an optional software add-on to Total Materia specifically developed for identifying metals from their composition. Step 1. The chemical composition for an unknown material is obtained from some type of measurement instrument such as a spectrometer. The data is entered into the relevant SmartComp fields. Step 2. A list of potential materials is generated instantly. 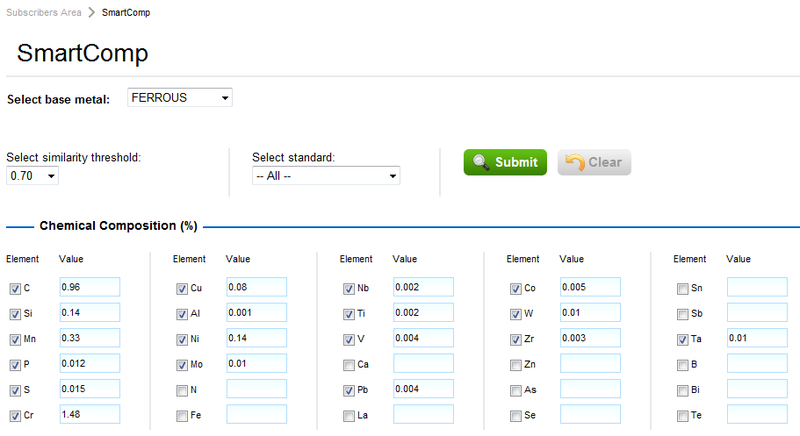 Step 3. Review the properties of the material candidates. SmartComp is based on a unique, patented SmartMetals(TM) technology that is recognized and used by many of the world’s most prominent companies, including global leaders in the spectrometer industry. Click here to find more details about SmartComp.